Reason for reading: Received review copy from Ballantine Books via NetGalley. Why must it be me? I wondered. When I am so clearly inadequate to my destiny? Before she can journey from sunlit picnics with her sisters in Vienna to the glitter, glamour, and gossip of Versailles, Antonia must change everything about herself in order to be accepted as dauphine of France and the wife of the awkward teenage boy who will one day be Louis XVI. Yet nothing can prepare her for the ingenuity and influence it will take to become queen. Filled with smart history, treacherous rivalries, lavish clothes, and sparkling jewels, Becoming Marie Antoinette will utterly captivate fiction and history lovers alike. There was some popularity with Marie Antoinette books a couple years ago, but despite glancing in their direction I never really read any of them. This book had been making the blog rounds lately, though, and I was curious. It is the first book in a trilogy, so even though there will be a lot of info provided by the end, it is broken up into 3 books. I thought this was a lot more practical than the chunskters I have seen on the book store shelves about her. It is obvious that the author did a lot of research for this book. She explains at the end of the book what was true and what was a bit of tweaking on her part. It makes for a very interesting look at one of France's tragic queens. 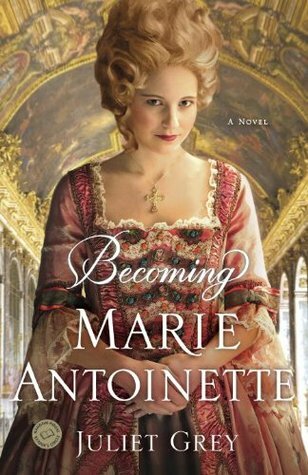 Many people know the basic story of what happened to Marie Antoinette, but this book goes back and starts when she is just a little girl and then carries on to when she marries her prince and becomes the first lady of France. Her mother tried to prepare her the best that she could, but she was very young and naive. It was an over-whelming experience for her and sometimes she did not handle things very well. It is a lot of responsibility for one so young. It was rather interesting to watch her transformation. In order to become the dauphine of France, they have a lot of criteria for her. She needs more education, for starters. This is something that never really works for her. When she goes to France she essentially has to leave everything of Austria behind, so she also has to work on her accent. Then, there is her appearance. By rights, Marie was a very pretty little girl, but she did not meet the standards of the French monarchy. She has to drastically change her hair styles, she has a man in who painfully straightens her teeth, and she really needs to develop more. She is very slow compared to her sisters and still has a way to go when she is deemed acceptable by France. Nothing will be easy for her. She is still so young, so it has always amazed me what these young monarchs must both endure and accomplish. This book was really quite good and I am looking forward to the next book. I want to see what Marie Antoinette accomplishes next. With history, even though you know what is going to happen, a small part of you is hoping for a different outcome. I know it is silly, but I know what lays in store for Marie and her family. I still look forward to reading on. Juliet Grey has brought France alive in this book and I look forward to living in it again next year. I recommend this book to both historical fiction fans, readers who love Paris, or simply reads that like a compelling story. I got this last week and am excited about it because I know nothing about Marie Antoinette. I'm glad to see it's well researched and written. I'm really glad that you enjoyed it. After reading a lot of positive reviews for this one I got it from NetGalley too! **bermudaonion: I hope you enjoy it! *Staci: I am a big fan of NetGalley.. I'll take a look at this. You may also enjoy the earlier book I reviewed on The Hidden Diary of Marie Antoinette as well as Abundance by Sena Jeter Naslund, which I haven't read yet (obviously) since I just picked it up today. **theliteraryshack: It was a really good early glimpse into a famous monarch. I hope you enjoy it! This sounds very intriguing. I read a biography of Marie Antoinette as a teenager and was fascinated by her. I'd be very interested to read more, not least because I must have forgotten everything I knew about her in the 20 years that have passed since then! **litlove: I just read Revolution by Jennifer Donnelly and Marie Antoinette's family is in the background of the story. So, she was on my mind when I went to read this book. The book didn't go into a lot of detail, but did give a good showing of her tragic end. It refreshed my memory before going into this book. I really just haven't read much historical fiction, and I really don't know why. I think it scares me a little. Like I'm afraid it will go over my head if I don't already a good bit about the said historical period. I enjoyed this book, too. You can tell it's a good book when it makes you hope for a different outcome, even when you know how things will play out. **Anna: Exactly! I am looking forward to the rest of the trilogy.